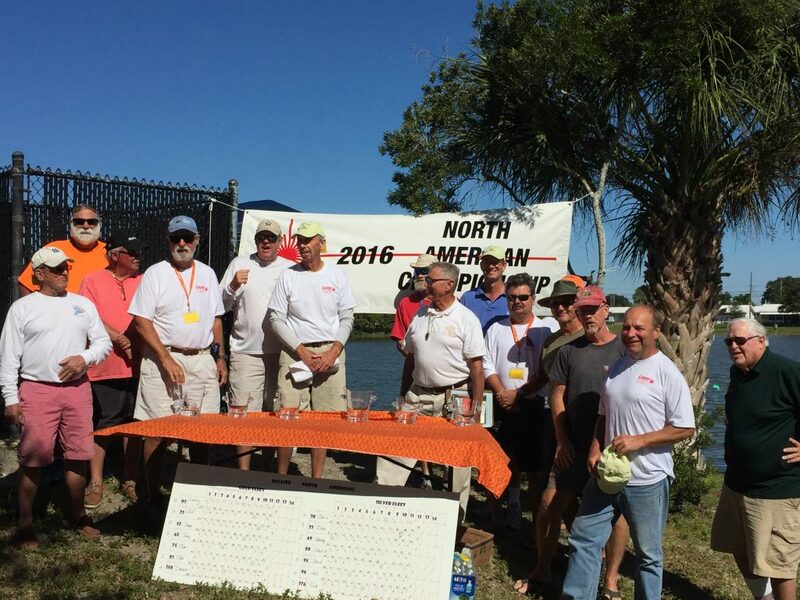 The RC Laser North Americans were held this year by the brand-new Tampa Bay Area fleet, led by long-time sailing leader Steve Lippincott. Freedom Lake is large enough but has the disadvantage of trees on one side. The wind, however, cooperated in direction for excellent racing. Launching the boats with a long bulb keel was by a Lippincott creation fashioned of PVC pipe that slid the boats, bow first, zipping out in the lake. A floating dock facilitated retrieving. Fourteen boats came from eastern USA and the Bahamas. Half the fleet was local to the area. Saturday consisted of twenty-two races, each having seven boats. Sunday the fleet was divided evenly into Gold and Silver fleets for 11 races for each. Jim Kaighin, a regular on the RC Laser scene nationwide, ran away with the title. There were two throw-out races. He used one when his battery died, the other for an uncharacteristic finish in one heat. Otherwise he scored a total of 28 points in 20 counted races, low point scoring. It was not the boat. There is nothing allowed to be done to modify these boats. Even sanding or polishing the hull or foils is not allowed. Everything must be supplied from the builder. He just sailed the boat consistently very well. Jon Luscomb of Jupiter, Florida was second and Calvin Obara of the local fleet third in Gold fleet. In the Silver fleet the top three were Steve Hopkins of Lafollette, TN, Henry DeWolf from Palm City, Florida and Rick Sylvester of the local fleet. Steve Lippincott had a terrible regatta. The organizer who races seldom does well. For regular sailing the following Wednesday he was on top of his game again. Many volunteers made this a premier event: Steve Lippincott did the organizing and inviting. His wife Lynn did the most important job of feeding us. Son Steve Lippincott Jr. manned the paddle board to set and move marks. Teresa Ray Gay figured out who was sailing in the next heat and did the scoring with the able help of Jamie and Kristal. Dave Ellis worked hard to keep up with the many wind shifts as the Race Director. This was a unique experience for this race officer who usually runs major events for performance dinghies. In a few months, the 2017 North Americans will travel to Marsh Harbor, Bahamas. Carry your boat with you as baggage.